I feel like this post needs to start with an apology. I mean, first there’s the whole repetitive thing. I know that I posted a red velvet cake recipe last week, so it’s a little soon for another red velvet recipe. 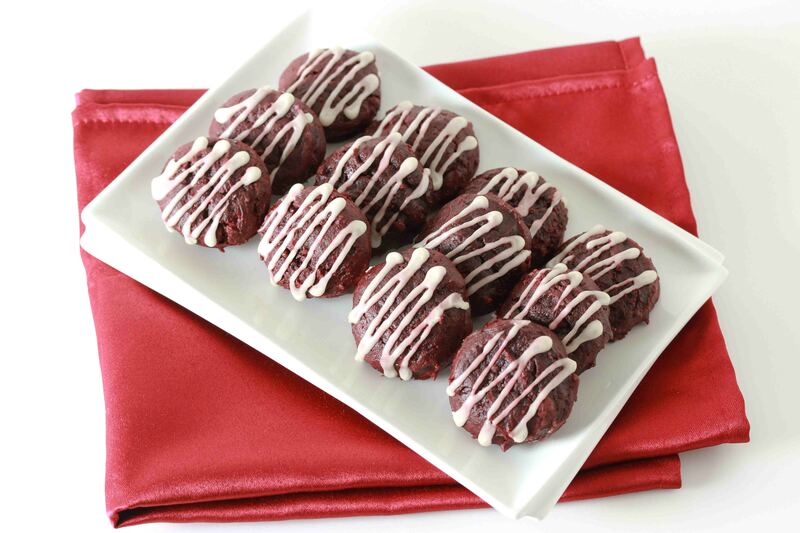 And then there’s the whole “being too trendy for my own good thing.” I mean, January is ending, which means that food blogs are about to get overloaded with red velvet in preparation for valentine’s day. So while this post may seem like my desperate attempt at getting ahead of the game, and getting traffic at the same time, I assure you, that isn’t the case. Let’s blame this post on my brother-in-law. You see, my brother-in-law hates chocolate. Or so he thinks. Insane. I know. Moving on. So whenever my sister and her family come for a visit, or I visit them, I find myself enormously challenged to come up with non-chocolate desserts. And while some of my favorite and most popular recipes were inspired by this very restriction, I came up with an interesting discovery. If said brother-in-law doesn’t know that an item has chocolate, he’s totally cool with eating it. Which brings us right back to red velvet. And why I made them this week. I’m going to be spending the weekend at my sister’s, and I, of course, am bringing the dessert. This dessert. Let’s see how he loves it! No, my brother-in-law doesn’t read this blog. Why do you ask? Now let’s talk about this recipe. And how it’s so good that I totally won’t apologize for it. I invented it at 11:30 last night, after being completely unhappy with the results of my google search. 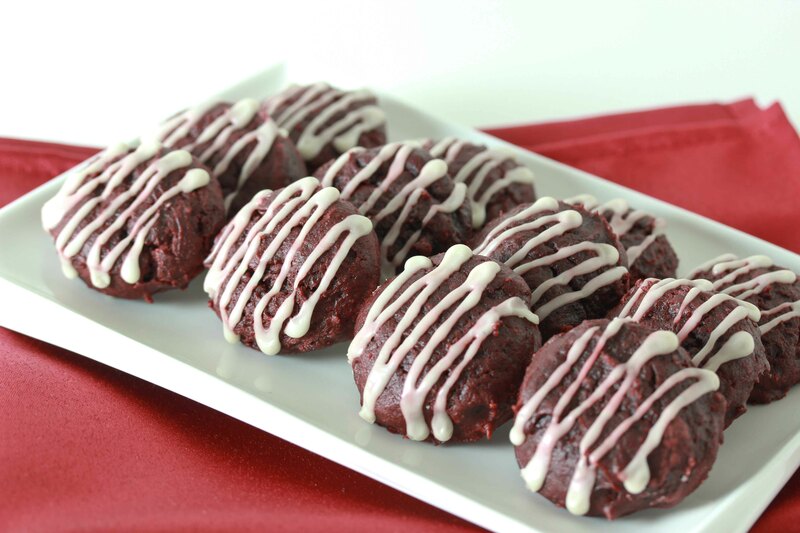 All the red velvet cookie recipes that I found were either made from a mix, or they were basically chocolate cookies with red food coloring. 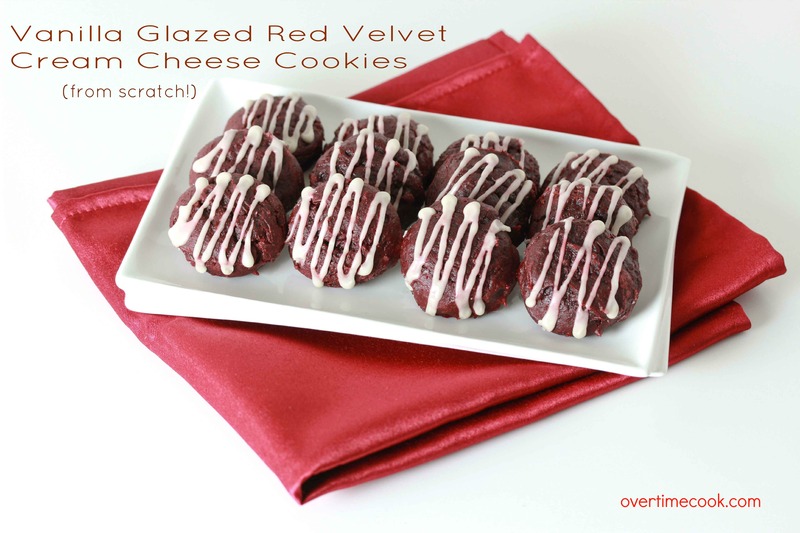 I wanted to get the proper red velvet texture, so I made these. And then I decided that topping them with cream cheese would be nice, but why not dump the cream cheese right into the batter? Genius. I know. And then, in an effort to be somewhat less cliche, I opted for a vanilla glaze. Don’t look at me like that. There’s cream cheese in the dough! Yep, they’re that good. Now let’s see what my brother-in-law has to say about them. In a small bowl, combine the milk and vinegar and set aside. In the bowl of an electric mixer, beat together the butter/margarine, cream cheese, sugar and brown sugar until creamy. By this time, the milk should appear somewhat curdled. Add it to the mixer and beat to combine. Add the egg, food coloring and vanilla, beating to combine after each addition. In a separate bowl, whisk together the flour, cocoa powder and baking soda. With the mixer on a low speed, slowly add the dry ingredient mixture and beat until just combined. Use a small cookie scoop to drop the dough onto prepared cookie sheets. Skip the glaze if you don’t want the extra step, but it sure is pretty! Drizzle glaze over cooled cookies. Use a plastic squirt bottle for an even and neat look. Sounds (and looks) amazing! Making these for Purim seuda! yum! looks fantastic! is it that time of year already? WOW WOW WOW! How have I never thought of cream cheese IN the batter?!?! Makes so much sense. These are a must try!!! Yum! Or at least, it looks and sounds yummy! I’m assuming its supposed to say 1/4 c. milk…. Thanks for spotting that! Fixed it. hi I’m doing this recipe right now is dough supposed to be very very sticky? these cookies look divine… im gonna try em now.. how many cookies does this yield? i may have to double recipe. I have to try these…..looks soooo good! Hi! Are they supposed to be very gooey or should I bake them for longer?